This 12 safari takes you to Murchison Falls, the Kibale forest, Queen Elizabeth, Bwindi National Park and Lake Mburo National Park in Uganda. 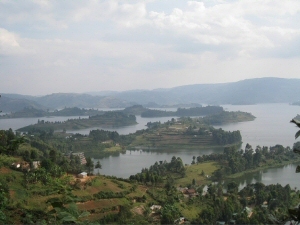 in addition you will explore the Kasenda Crater Lake area and marvel at the beautiful scenery surrounding Lake Bunyonyi found in Kabale. Among the activities you will enjoy will be game drives, chimpanzee trekking, gorilla tracking and birding. Following an early breakfast, you will drive from Kampala towards the northwest, visit the impressive Ziwa Rhino sanctuary to track rhinos and have lunch along the way. 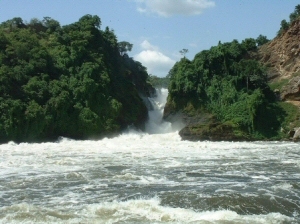 From there you will continue to Murchison Falls National Park, taking a short stop at the top of the falls, to the great Nile make its way through a small 7 meter gorge and thunderous drop to more than 43 meters below. Dine and overnight at your lodge. In the morning you will have a game drive along the Northern banks of the river and with the help of your guide you will see various animals. After you will return for a late breakfast at the lodge, rest and lunch. In the afternoon, you will have a boat ride to the bottom of the falls and you will see several animals such as hippos, giant crocodiles and birds, and not so far away Uganda kobs, elephants and waterbucks. There will be an optional 1 hour hike to the top of the falls where you will find your driver who will drive you back to the lodge. dine and slumber at the lodge. Today you will depart from Murchison Falls NP and head southwest driving through the impressive Albertine Escarpment of the Western Rift Valley; have Lunch en route. Go through Hoima to the beautiful Fort Portal town which is Tooro kingdom’s capital, located in the shadow of Mountain Rwenzori. Dine and overnight at your lodge. 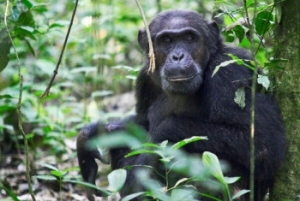 Today you will actually spend most of your morning tracking chimpanzees in the forest. These primates are quite mobile and seeing them is not guaranteed however the 4 – 5 hours forest walk will be very rewarding with views of other primates and birds like the hoestes, grey cheeked mangabeys, Red-colobuses, Red-tailed monkeys and the Blue tailed monkeys plus butterflies. Your guide will detail you about the impressive flora and fauna found in this verdant forest. After lunch, you will visit the Kasenda Crater Lake area or take the bigodi community initiative swamp walk. Dine and slumber at your lodge. After breakfast you will leave for Queen Elizabeth National Park. The drive will reward you with great views of the Rwenzori Mountain Range as well as game viewing. You will have lunch at your Lodge, located on the peak of the Mweya peninsula. In the afternoon you will have a boat cruise on the famed Kazinga Channel for 2 hours and this will take you past very high populations of hippos, plus other several animals drinking water. This boat cruise offers you a great chance for photography, game viewing as well as bird watching. The abundant bird life is multicolored and amazing with more than 550 species. Dine and sleep at your lodge. Begin the day with a game drive in the morning along the Kasenyi plus Queens Mile to see elephants, mangoose, Uganda Kobs, buffaloes, lions, spotted hyenas, waterbucks and warthogs, plus various bird species. This drive will take you up to Lake George and later return for lunch at your lodge. After lunch you will go and explore the Crater Lakes region and later dine and slumber at your lodge. You will set out with a packed lunch and drive to Bwindi through the Ishasha area of the Park looking for the tree climbing lions which can only be seen in this part of Uganda. Fortunately the terrain is open savannah scattered with acacia and fig trees. You will enjoy your picnic lunch and later continue to Bwindi Impenetrable National Park where you will dine and slumber. Right After breakfast in the early morning you will head to the park headquarters where you will be briefed before going gorilla tracking. The rainforest is thick and it’s crisscrossed by several animal trails. The joy of finally meeting the gorillas and even spending an hour with them will certainly be very memorable an experience. Generally Gorillas are huge peaceful yet shy animals however you will have a chance to take photographs and observe them play, feed and care for their young. You will later return and dine at your lodge. In the morning you will head to Lake Mburo National Park which is the smallest of Uganda’s national parks, and there you will have a game drive to see elands, topi, impalas, oribi, zebras and cape buffalos; plus a boat ride on the lake. This park is a very stunning birding paradise with 250 bird species such as Carruther’s cisticolas, Papyrus gonoleks and Brown-faced lapwings. After lunch you will head back to Kampala with a stopover at the equator crossing for photography. Dine and slumber at your lodge. Today basing on your time of departure, you may have a city tour to the cultural sites, craft shops, museum or even the Mabira forest. You will later be transferred to the airport for your departure flight and this will mark the end of our 12 day adventure in Uganda – The Pearl of Africa.